Gare Joyce's first novel is the first hockey book release of 2012. 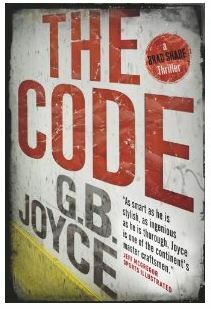 Code, The , which comes under the pen name G.B. Joyce is a 352 page novel from Penguin Books. Buy The Book: Amazon.ca - Chapters. For fans of Elmore Leonard and Robert B. Parker, meet hockey scout turned private detective Brad Shade, from “one of the best sports writers on the continent. Brad Shade has been just about everywhere hockey is played. He has ridden the buses in the minors, shared dressing rooms with the legends of the game, closed bars with guys destined for the Hall of Fame, and dropped the gloves with journeymen like himself who’ll never get near it. And even though he’s retired after fourteen years of bouncing around the league with more losses than wins and his net worth eroding, he’s still living out of a suitcase and still taking numbers. That’s his day job—scout for LA, where someone in management owes him a favour from his playing days. But when the brutally murdered body of coaching legend Red Hanratty turns up in the parking lot after an old-timers charity game (Shade goes scoreless, again), Shade’s job of scouting the local phenom starts to overlap with investigating the killing of the kid’s grizzled old coach. When the killer goes after Shade’s girlfriend, he finds out that guys don’t stay in the league because they’re good—they stick around because they’re smart enough to know what needs to get done, and just ornery enough to actually do it. From small-town rinks to the draft tables in the big league, G.B. Joyce introduces us to a character Canadians already love—the fourth-liner with a self-deprecating sense of humour and an oversized will to win—and weaves a story out of strands of resentment, greed, and fear that span generations and build to a surprising, thrilling conclusion.